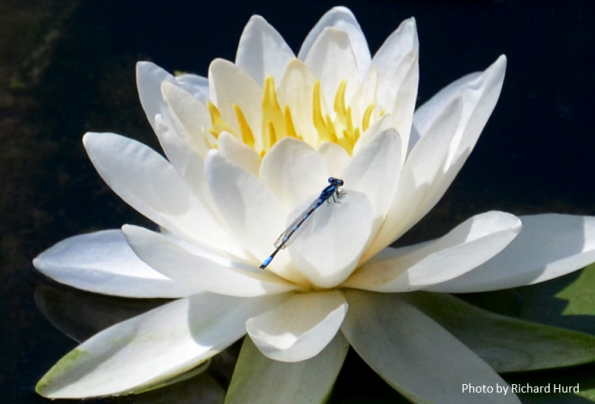 What’s Going on with Lake Wingra’s Aquatic Plants? Beach and boat season are almost in full swing! These activities are relaxing, playful, adventurous, and downright unpredictable. To borrow from Forest Gump’s mama, having an experience with aquatic vegetation (aka macrophytes) “is like a box of chocolates, you never know what you’re going to get.” When you paddle, luck might allow you to observe a beautiful blooming white water lily or you might spend time frustrated at the fact that your boat or paddle keeps clogging up with weeds. When you swim, you might feel the panic set in as a tickly plant wraps around your leg or you might be mesmerized watching the aquatic life darting and dashing between plants. It happens to all of us. Throughout all these experiences, do you wonder how much vegetation is too much, is Eurasian water-milfoil taking over Lake Wingra, or what strategy do mechanical harvesters on the lake follow, if any? Well, here are some answers! The Wisconsin DNR conducts aquatic plant surveys on all the Dane County lakes at a minimum of every few years. Some of the findings from their 2017 survey are in the info graphic below. 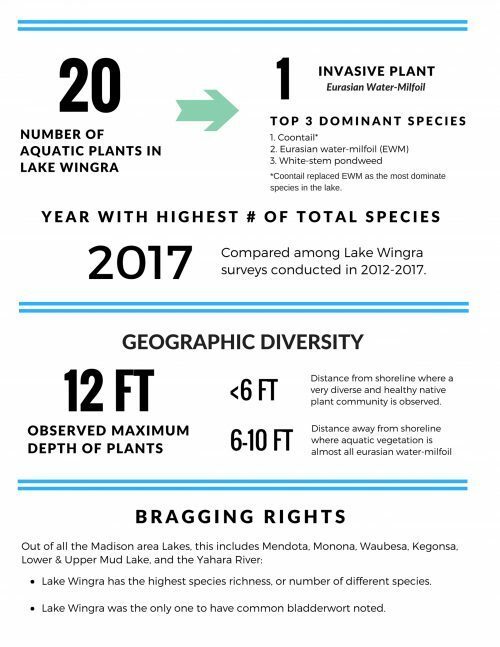 All in all, it looks like we have a lot to be proud of in terms of Lake Wingra’s aquatic plant diversity. These changes don’t always seem so obvious to the naked eye; however, they show Lake Wingra’s aquatic plant life is making progress. What is the main goal of cutting on the lake? Cutting is to preserve the health and lake ecosystem while harvesting Eurasian-water milfoil (EWM) and other nuisance vegetation so lake users can reasonably boat, fish, and swim. Will the County cut in areas where there is diverse vegetation close to the shoreline? No, with some exceptions. The county plans to avoid harvesting (cutting) nearshore specifically to protect the diverse plant community. The only places where nearshore cutting will occur are close to the Wingra Park boat launch, fishing access points along Vilas Park Road, and the Vilas Beach area. All of these nearshore cuts are to provide shoreline recreation and lake access. When does the County decide to cut on the lake? Dane County has a plant scout that visits the lake to evaluate the conditions and provides recommendations on when harvesting should occur. How does the County prevent the transfer of invasive species from one lake to another? Dane County cleans and disinfects the harvesting equipment before moving it to other water bodies. This includes removing visible plants, mud, debris, water, fish or animals from the machinery. Does the County plan to use chemical treatment on the lake? No. The County believes that could undermine the ecological diversity of the plant community.